~* West End Designs Journal *~: I'm back...with cupcakes!! Hi Everyone! I'm back! My wrists are feeling a bit better and I can actually get away without wearing my brace all the time! Yay for that! I'm still doing the stretching exercises though. It would probably be a good thing if I continue those on a regular basis, if I can remember! Yesterday was my EIGHTH wedding anniversary! I can't believe it! Time flies when you're having fun! ::wink:: I made Mark's favorite dinner, Apricot Glazed Chicken, Baked Potato and Green Beans. 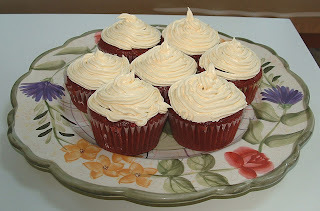 For dessert, I made "Crimson Velveteen Cupcakes" from the "Vegan Cupcakes Take Over The World" cookbook. Now before you make that face, and think I am going all vegan preachy on ya, no worries, I will NOT! I like cheese way to much to change my vegetarian lifestyle to veganism! (Which cheese will be the subject in an upcoming post!) BUT vegan baked goods are DELICIOUS!!! (no, really!) Anyone who has tried them will agree. They are moist, yummy and pretty much guilt free without the butter! Check out these babies!!! I've said it before and I'll say it again, you NEED this cookbook!!! I have made a bunch of really awesome (if I do say so myself!) bracelets that will be posted over the next few days! Be sure to stop by the shop to check them out!